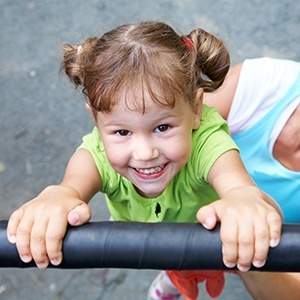 Your child’s smile is probably one of the most precious things to you as a parent, so of course you want to keep it healthy as they grow and develop. The best way to do that? Make sure they brush, floss, watch their sugar, and start visiting the dentist from an early age. At Jacksonville Complete Dentistry, we’ll make sure your littlest smile grows into a strong and beautiful one. We know you probably have many questions about your child’s dental care, so on this page, you’ll find answers to two of the most common questions parents ask us every day. Why Choose Jacksonville Complete Dentistry for Children’s Dentistry? We recommend that a child should start seeing a dentist around the time of their first birthday. These early visits are key to accomplishing 3 important things. Firstly, it will give Dr. Johnson or Dr. Barker a chance to make sure your child’s teeth are developing correctly. Often, our dentists are able to spot problems early and treat them before they can become much more serious in the future. Dental treatment at a young age is typically faster, simpler, and much less expensive than waiting till later. These appointments will also give us a chance to teach your child about the basics of dental care, like why taking care of their smile is so important, how to brush, how their diet affects their teeth, and so on. Between these regular visits and your help at home, this will help your child establish healthy habits that will take care of their smile for a lifetime. 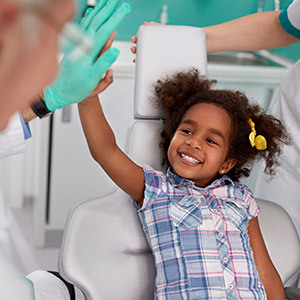 And lastly, early visits will help your child establish a positive connection with going to the dentist, assuring that they’ll keep up with their appointments as they grow up and become more independent. A dental office can be a bit of a scary place for a child, but that’s mostly because it’s somewhere new. We advise that before you bring your child in for their first appointment, talk to them about going the dentist in a positive way and tell them how great their teeth are going to feel. This will help them come in with a much more positive attitude and less anxiety. Of course, we’ll do our part, too! When you arrive, your child will be greeted with a smile and given a chance to walk around and explore the office. You’ll be with them the entire time, and we’ll always go at their pace so we can ensure that they’re completely comfortable. Once you get to meet their dentist, they’ll take a little time to talk to you about your child’s dental history and any concerns you might have. From there, they’ll perform a brief oral exam and gentle cleaning while your child sits in your lap. Then, they’ll help you come up with a strategy to take care of your child’s new smile. After this first appointment, you should start bringing your child in regularly every 6 months. Children can suffer from many of the same dental problems as adults, but by bringing them in for friendly visits here at Jacksonville Complete Dentistry, we can make sure your child’s teeth are always healthy, problem-free, and ready to be shown off. If you have any questions about your child’s dental care, or if you would like to schedule an appointment, please contact us today.